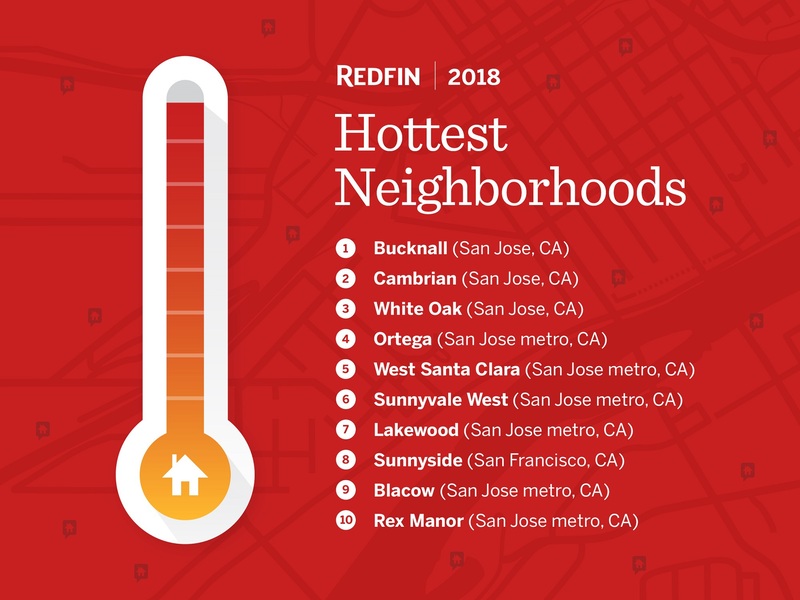 Redfin today released its top 10 hottest neighborhoods of 2018, and San Jose, California nabbed nine of those spots thanks to better affordability than tech hubs Silicon Valley and San Francisco. Redfin says the impact of increased migration to the city is already being felt — inventory is currently at 0.5 months of supply and homes are flying off the market within 12 days of being listed. “While the San Francisco peninsula has traditionally been the hottest of the hot places, we’re seeing it become unaffordable for even the tech giants that helped create its demand in the first place,” said Redfin Silicon Valley agent Kalena Masching in the report. Bucknall, which is located in West San Jose, came in at no. 1 with a median home sales price of $1,565,000 and an average sale-to-list price ratio of 123.8 percent. Lastly, every home listed in Bucknall sold above listing price. Masching says the average Bucknall home sells within eight days, which is due in part to the neighborhood’s vicinity to a number of sought-after amenities. “Bucknall borders the Saratoga Westgate shopping plaza and has easy access to five grocery stores, multiple gyms and yoga studios, shopping, highly rated schools and a movie theater to help keep people entertained,” she said. South San Jose’s Cambrian neighborhood took the second place spot with a median home sales price of $1,244,000 and an average sale-t0-list ratio of 118 percent. And, like it’s neighbor to the northwest, every home listed in Cambrian sold above listing price. While homebuyers are attracted to Bucknall because of its family-friendliness, buyers like Cambrian because of easy access to public transit and San Jose’s vibrant downtown. “Compared to other neighborhoods in San Jose, you get more home for your money. Locals enjoy evening farmers markets in the spring and fall, many public parks and greenspaces, and the nearby Camden community center, which offers lots of recreational activities for kids and adults,” added Redfin San Jose agent Kimberly Douglas. Rounding out the top three is White Oak in West San Jose. The neighborhood has a median home sales price of $1,010,000 and an average sale-to-list ratio of 105.7 percent. But, only 66.7 percent of homes sold above listing price, which means buyers have more room to negotiate. Douglas says White Oak is a neighborhood of choice for first-time buyers looking for a bargain while being able to enjoy the attractions surrounding downtown. The following seven neighborhoods have median home values ranging from $1,005,000 (Blacow) to $1,945,000 (West Sunnyvale) and average sale-to-list ratios around 90 percent. But, as tech companies begin venturing outside of California and the West Coast as a whole, Redfin chief economist Nela Richardson said neighborhoods in other cities on the map, such as Washington, D.C., Chicago, Columbus and St. Louis, are gaining attention. “Also, these areas have a mix of single family homes, condos and townhouses, which make the neighborhoods accessible to a wide range of incomes,” she added. Each of these neighborhoods “within reach” has median home sales prices below $270,000, and buyers have much more leverage in negotiating lower sales price since no more than 55 percent of homes in each of these neighborhoods sell above list price. 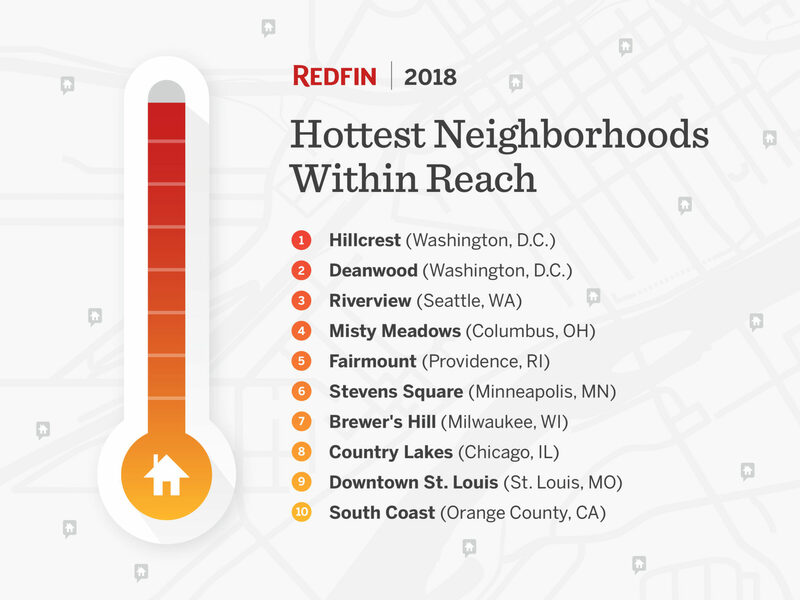 Redfin’s Hottest Neighborhoods is a prediction based on the most recent growth we’ve seen in page views and favorites on Redfin.com. We checked in with Redfin agents around the country to find out what’s been driving these trends.